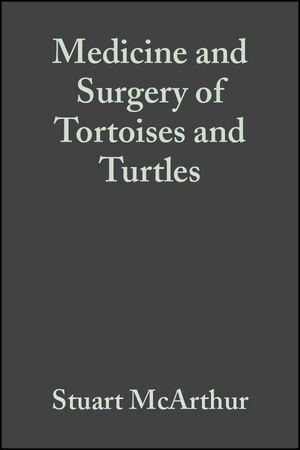 Medicine and Surgery of Tortoises and Turtles is an innovative and exciting new reference book on the management of chelonians. Covering everything from species identification to virus isolation techniques, it is an indispensable source of information for veterinary practitioners treating sick or injured chelonians and all those involved in captive chelonian care, chelonian conservation medicine, and scientific research. Detailed sections on anatomy, physiology, husbandry, nutrition, diagnosis, diseases, anaesthesia, surgery, therapeutics and conservation. Over 1000 full-colour photographs, which take the reader through disease recognition, practical nursing, captive husbandry and common surgical conditions. Down-to-earth clinical information presented in a user-friendly format. Medicine and Surgery of Tortoises and Turtles is both a step-by-step photographic guide and a detailed source of clinical and scientific data. As well as this, it contains fascinating material that has never been published before, ensuring that it will become the primary chelonian reference book. 1. Introduction (Stuart McArthur, Roger Wilkinson, Michelle Barrows and Jean Meyer). 2. Infectious Agents (Stuart McArthur). 3. Anatomy and Physiology (Stuart McArthur, Jean Meyer and Charles Innis). 4. Nutrition (Stuart McArthur and Michelle Barrows). 5. General Care of Chelonians (Stuart McArthur and Michelle Barrows). 6. Diagnosis (Michelle Barrows, Stuart McArthur and Roger Wilkinson). 7. Clinical Pathology (Roger Wilkinson). 8. Diagnostic Imaging Techniques (Roger Wilkinson, Stephen Hernandez-Divers, Maud Lafortune, Ian Calvert, Michaela Gumpenberger and Stuart McArthur). 10. Feeding Techniques and Fluids (Stuart McArthur). 11. Interpretation of Presenting Signs (Stuart McArthur). 12. Problem-Solving Approach to Conditions of Marine Turtles (Stuart McArthur). 13. Problem-Solving Approach to Common Diseases of Terrestrial and Semi-Aquatic Chelonians (Stuart McArthur). 14. Anaesthesia, Analgesia and Euthanasia (Stuart McArthur). 15. Surgery (Stuart McArthur and Stephen Hernandez-Divers). Appendix A: Turtle Conservation (Stuart McArthur). Appendix B: Plants Suggested to be Poisonous to Chelonians (Stuart McArthur). Appendix C: Care Sheets (Stuart McArthur and Michele Barrows). Appendix D: Rehabilitation of Asian Chelonians (Charles Innis). Appendix E: A Selective Chelonian Taxonomy (Roger Wilkinson). Appendix F: Viral Disease (Stuart McArthur). "A welcome addition to the expanding base of literature devoted to reptile medicine."